You have exhausted the microfilmed civil records and are ready to move further backwards in time by using parish records. You have bought your ticket to Italy and are ready to tackle the local priest. You can find the address of the parish church at www.chiesacattolica.it. (Or http://www.parrocchiemap.it/ see comment below. ) Write to the priest about one month before your visit and let him know which days you will be in the area and ask permission to do a search. DO NOT include any details of your research except to say that you will be looking for Domenico Antonio Rossi baptized around 1754. Include an addressed envelope for his reply (no stamp necessary). If you don’t receive a reply, and you cannot telephone for an appointment be prepared anyway. Plan to be in the area at least one night if you don’t have an appointment. When you get to the town ask what time the mass is and be at the church at least 30 minutes ahead of time. If the priest is not already inside, then wait outside. Watch for side or back entrances. The priest may not arrive until a few minutes before the service so be prepared to wait until it is over. If it is a weekday the mass usually takes about 30 minutes, maybe less. Usually the priest will be available for a few minutes for the parishioners so be patient. If he cannot be available that day ask for permission to search the next day. Be flexible. He doesn’t know you, and cannot change his schedule easily. Ask if a sacristan can be available and indicate that you are prepared to pay him for his time supervising the search. Most priests will try to accommodate you but most do not understand that you want more than one or two records and that you will need at least two hours of search time. Notebook and pencil, pedigree charts and family group charts. Lamp – not absolutely necessary but lighting is traditionally bad in church offices. If you can find a battery operated folding lamp it will help with the reading of the documents, otherwise hope for a bright window. Camera – I do not recommend the ipad for taking document photos. It is too large to hold steady and does not have the ability to lighten the image. An iphone, on the other hand, has great image capture and has the ability to lighten the image without using flash. You should not use flash on old documents. You need to remember that every priest ‘did his own thing’ as far as record keeping was concerned. The important thing was to record the sacraments. Baptism, confirmation/first communion, marriage and the last rites. What information they included was entirely up to the priest’s discretion. Most did a really good job, but some did not, although they did improve as time went on and the church began to standardize the information required in the record. Latin was the language of the church, and while many records are written entirely in Latin, there are also those written in a mix of Latin and Italian, Latin and the local dialect, and even just Italian. Abbreviations were common and in many cases peculiar to the priest himself. Don’t expect to be able to understand everything that is written in the act. If you hope to search parish records personally, don’t assume they will be housed in the local parish church. They probably are, but many Diocese now are gathering the older records for safe-keeping. You need to find this out before you go. You can do this by phoning or emailing the Diocese and asking where the records are held for the period you need. Ask if you will be allowed to search personally. Recently some Diocese’s have been insisting that the records are private and only the priest can search them. Some of the priests will permit the search anyway. It all comes down to them. Rome is one Diocese that has taken records from most, but not all, of it’s parishes and housed them in the Archives of the Vicariato in Rome. Personal searches are permitted but they require a letter of introduction from your local Bishop and will usually only permit you to ask for 4 books a day. (Take a friend) They will usually permit photos of the records but ask first. Not all Diocese Archives are open every day or even all day. Be sure to make an appointment. Take some small change as they do charge for photocopies or photographs. If you have booked a search of the parish records at the local church this might need to take place during the mass, and under the watchful eye of the sacristan so be prepared. Your cotton gloves will make a good impression although they will rarely use them, you should. Ask permission to take photos of the records. Use a pencil (not a pen) to make notes. Even better, use your ipad or phone to make verbal notes. Ask first if there are any Stato d’Anime you can look at. Then start checking baptism/marriage/baptism records and work your way backwards. Most, but not all recent books will have indexes. Check both front and back of the book. Sometimes the index will be by first name instead of surname, which may nor match the name used civilly or daily. It may not match the name used in the marriage record. If the book covers many years of baptisms, first calculate the time period you think the record should be found, then locate the starting and ending pages for this time frame. THEN check the index for names occurring in those pages only. Otherwise the repetition of first names will be very confusing. Take a few minutes before you begin searching to study the inventory, locate any indexes, and study the format of the records to familiarize yourself with the elaborate script. Ask if there are any INDEX books. I have found in many parishes, at some point someone has gone painstakingly through the books and created an index, often covering many years, even decades. I search regularly in one parish that has index books from 1540 to present day. The books themselves may not be in any particular order, often the size of the book means it is placed out of sequence on a different shelf. Just because it’s not where you expect it to be, doesn’t mean it isn’t there. 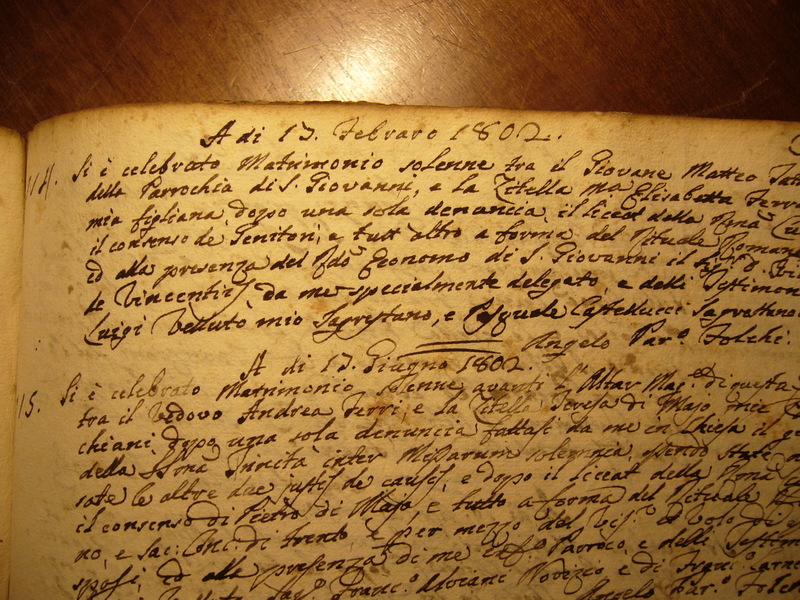 STATO D’ANIME records are much like a census, recording the families in the parish, and often keeping them up to date by adding babies, marriages and deaths as they occurred. They may be organized alphabetically, or by street or zone but always by Head of Household. 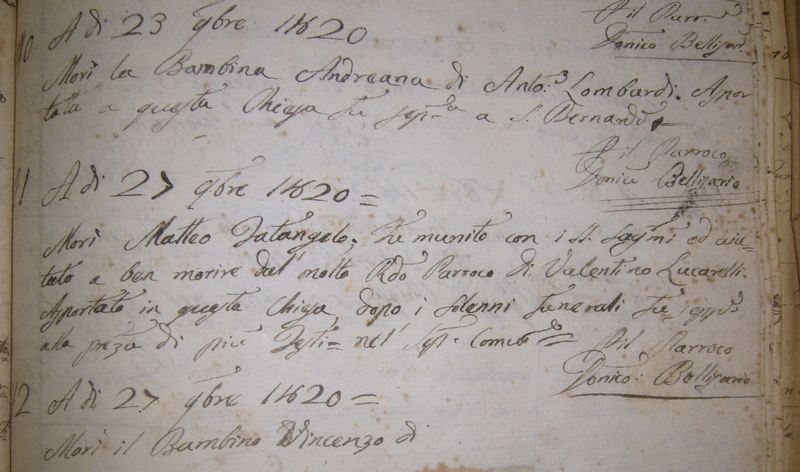 They may include baptism dates, and ‘cresima’ dates and sometimes information on the parish of origin. Not all parishes did these ‘census’ records but when you find them they are a gold mine. BAPTISM records, vary in format even within the same parish. Some begin with the baby’s name, followed by parents names, including the paternal names of both mother and father. Others begin with the priest’s name and qualifications, name of the parish etc. before mentioning the parents, followed by the baby’s name and then the Godparents. If you are lucky the baby’s name will be noted in the margin, or underscored in the text. This can be a godsend when there is no index and you must search page by page. Some parishes included the day and time of the birth and even the name of the midwife. MARRIAGE records often include the name of the father of the bride and groom, but less often that of the mother. Read the act carefully, if the parish is spread out, the marriage (unlike the baptism) may have taken place in one of the rural churches within the parish and this will be noted. I have seen small versions of a family tree with the record showing that the couple were not related until the 3rd degree, or noting that dispensation was obtained. CRESIMA records are usually just lists of names with the sponsors names noted. If the surname is a common one along with a common first name I don’t recommend wasting time checking these books. DEATH records are another time waster. Unless you need a death date for some reason (to confirm a second marriage) do not use the parish death records. They rarely list more than the age and/or parents/spouse names. The indexes (if there are any) will be very repetitive and you will have to check each record for the same name. If your time is short, this is one step you can give up in order to progress your research backwards in time. So many babies, named for their Grandparents died in infancy. It is so difficult to pick out of an index which ones are the ones you are interested in. If the first name and or surname is uncommon you might get lucky quickly, otherwise this is another time waster. Death records usually contain the name of the deceased, their age and if they received the last rites. If the death was of a minor it often includes the father’s and maybe the mother’s names. During epidemics, the priest occasionally noted the cause of death. i.e. cholera, smallpox etc. I have seen records that went into detail. One was of a man who was killed in a fight in a bar. The priest was obviously not impressed. Another was the drowning death of a young woman. Unless you have time to spare leave death records until another time. Remember to leave a generous donation to the church. I suggest 2-5 Euro for each record photographed with a minimum of 20 Euro. ← A ‘thank you’ note that made my day! http://www.parrocchiemap.it/ was suggested by Lucia as an alternative to the Catholic church site I mentioned in the first paragraph. I had never used this site, but will do from now on. It is much easier to navigate, has photos of the churches, names, address and phone numbers of the parish priest, times of the mass and even links to Google maps to show you where the parish is located in the town. It will even show you other parishes in the area and how close they are to where your ancestor lived. Thank you Lucia. A great suggestion. Thank you Ann for a well researched and presented article! I includes so much information that I didn’t know I needed. Thank you for sharing your knowledge and practical know-how!